I’m a manufacturer of hand crafted wooden flutes using traditional methods and finest materials. I currently produce unkeyed wooden D flutes based on original Rudall and Rose designs of the 19th century. 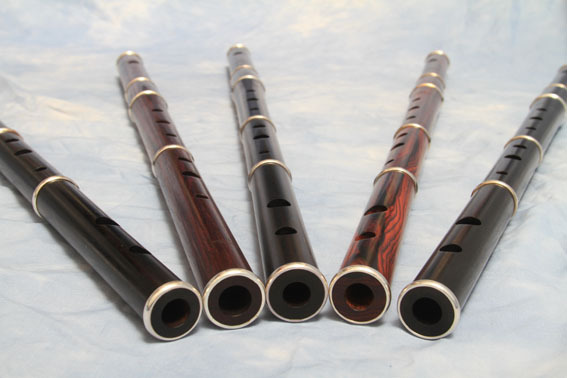 The flutes are made using the best quality African Blackwood with sterling silver tip rings and nickel silver tuning slide. I get the African Blackwood from a supplier who is a member of ‘Sound and Fair‘, ensuring it comes from a sustainable source and that the people growing the timber receive the full benefit. The flute has a vibrant sound in the upper register and full sounding bottom register with solid bottom D. The flutes are responsive and easy to play, with off-set tone holes to make it easier to cover the holes especially for those people with smaller hands.